Becoming an editor and proofreader has turned into quite the “hot” Work from Home job that many people are searching for. And for good reason! It’s not only a great job that offers a lot of different perks, it’s also a way to land a job that offers a bit of that workplace flexibility as well. Online proofreading jobs for beginners offer a great paying and flexible work from home option. Some companies are actively looking for full-timers to join their staff, while many other companies tend to hire more seasonally or ramp up during their busier times. If you are looking to dip your toe into the Work from Home Editing and Proofreading world, there are a ton of great companies out that there are looking to hire qualified and dedicated employees just like you! What exactly do an editor and proofreader do? Great question. In a nutshell, they edit and proofread. Pretty basic answer, right? Digging a bit deeper into the day-to-day, editors and proofreader’s read and review articles, words, posts, books, content, and basically anything that has to do with the written word. It can be words that are written or typed, and more than likely are a final draft that is being edited before final approval. Online proofreading jobs for beginners may sound like an unimportant position but these editors act as one of the last set of eyes on the written word before it is published and goes live. Talk about an important position! Just to explain a little further regarding these two types of positions. Many times these terms “editing” and “proofreading” are used interchangeably online by both those hiring and those looking for a job but there really is a difference. Make sure you understand the difference and what exactly is the job will entail before applying. Editing is usually dealing more with the overall feel and organization of a piece of writing while proofreading is more the editing of the details of a written piece such as spelling, grammar, and punctuation. Attention to detail. Crucial, absolutely crucial. As an editor, if your eyes are the last to view an article and it get’s published full of errors, that is not good! To be well-suited for this position, you must have an extremely strong attention to detail. Strong communication skills. If you notice any type of error or typo, you have to be able to communicate effectively and efficiently about what needs to be fixed. Time is money when it comes to getting something printed and distributed so strong communication skills are an absolute must. Customer Service skills should be top-notch. Not only will you be working for a company, but you will also be potentially communicating directly with clients and customers as well about the errors and mistakes that were found in their writing. And trust that this is something that you have to tread lightly in doing! You don’t want to offend them, but it’s also important to make certain that you communicate effectively what the errors were that you found in their work that needs to be corrected. Deadline driven. When editing content that has to be published by a certain date, deadlines are key! You have to be able to meet and adhere to strict deadlines in this field to be able to have continued success in your career. Can anyone become an editor or proofreader? While anyone can be trained to perform the job, it does take time and experience to be able to perform the job effectively. 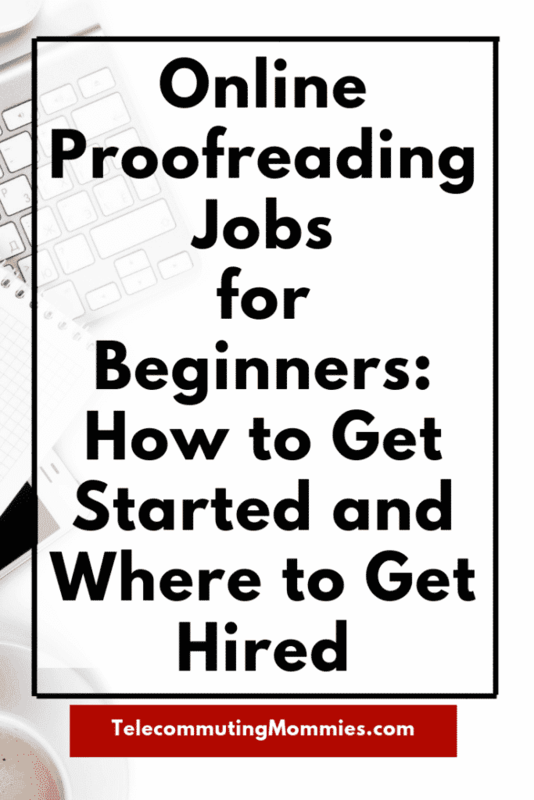 Typically, there aren’t as many entry-level Work from Home jobs out there that companies will hire when it comes to adding editors and proofreader’s to their team, but there are a few online proofreading jobs for beginners. Many companies prefer that you have some experience in the field as they are looking for editors and proofreader’s to be able to jump right in and get started right away. Is it possible to make a career out of becoming an editor or a proofreader? Absolutely. There are a ton of companies that are hiring for full-time editors or proofreaders! There are also a lot of companies that hire for freelance positions so really you have the option of working full-time from home in this industry or working part-time as a freelancer, whatever is the best fit for your lifestyle. With how fast this industry is growing, it has a positive and strong job outlook as far as job growth goes over the next several years because literally, everything print that is published via online, text, or book has to be edited or proofread. Talk about some potential for some major job security! These companies below are the editing and proofreading companies that hire people to work from home without any formal experience. This does not mean that you can get hired without having editing and proofreading skills. You still must be skilled in the field but many times freelance writers or bloggers or others develop these skills naturally because of previous jobs or experience. If you feel you have the necessary skills to become an online editor or proofreader then these companies are your best bet for getting hired without any previous job experience in this industry. Domainite- Does not require any previous formal experience but you must edit a sample as part of your application. Gramlee– No formal experience required. Kibin- Does not require any formal editing experience but you must take a timed pre-test to prove your grammar and style guide knowledge. Proofreading Services-No formal experience required but you must pass a test in order to be hired. This company hires for both part-time and full-time positions. Scribbr- Hires editors in a variety of languages. You must have a bachelor’s degree(in anything) but do not need to have any previous experience. These positions help edit and proofread college essays and papers. Great option for online proofreading jobs for beginners. SmartBrief– Many of their positions are on location but they do occasionally hire for freelance work from home positions. Must have previous editing and proofreading experience but not necessarily any formal experience. American Journal Experts– Must have a graduate degree or be in the process of completing one. Cactus Communications-Offers both full-time work from home positions and freelance positions. Most of their positions are in the medical, academic, or pharmaceutical areas and require experience in these fields. Edit911– Must have a PhD in English and previous experience. Edit Fast-Hires for writing, editing, and proofreading positions. Requires some type of previous experience and some positions also require experience within a certain field. Proofread Now-Must have at least five years of experience as a professional proofreader and must pass a variety of tests before being hired. Proofreading Pals– Must either be a graduate student or have a graduate degree with five years of experience. Scribe– Requires both writing and editing experience. Pay starts at around $60-70 an hour. WordsRU– Must hold a Master’s degree or PhD in any area of study and have at least three years of experience in editing or proofreading. Wordvice– Must be enrolled in or already have a graduate degree in any area of study plus two years of editing experience. If you think that editing or proofreading from home sounds like the perfect job for you but you don’t have the education or experience needed for some of the jobs above there are other options. You can actually start your own business proofreading. Not only is this a convenient work from home job because it requires no phone work but if you start your own business proofreading you can usually make more money than doing it working for someone else. If you think you might be interested in finding out more about this option you can sign up for a FREE 76 minute workshop. Proofreading skills are in high demand. Why not take advantage and find out how you can have the kind of flexibility and income that comes from starting your own business from home. If you are looking for other work at home companies there are many other options out there. This post may contain affiliate links but I never recommend products or services I do not truly believe in. As usual if you have any questions feel free to email me.